Newly renovated guestrooms completed June 2016! 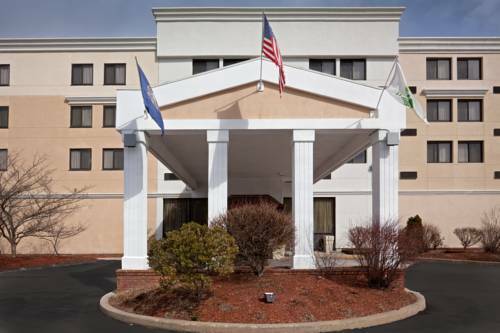 Situated in the heart of NH's Capitol, the Holiday Inn Downtown Concord is the only hotel located on Main Street. The charming, historic and newly redesigned downtown, with local restaurants, shops & pubs, is within walking distance. Business travelers will enjoy easy access to Interstate 93, Interstate 89 and Route 4; while families who want to experience New England will be pleased that we are only an hour away from ME, VT & MA. Not only is the hotel just steps from the Capitol Building & State Offices but it is also only 2 miles to Concord Hospital, St. Paul's School & NHTI; less than a mile to UNH School of Law & the Capitol Center for the Arts; and a short drive to the Outlets, NH Motor Speedway, Canterbury Shaker Village, Pats Peak & Gunstock. Our on-site restaurant, EJ's on Main, serves breakfast & dinner daily. Room Service is also available as an added benefit when youve had a long day! Complimentary amenities include high-speed wireless internet access throughout the hotel; parking; a 42 flat screen TV; and a fridge & microwave in all of our guestrooms. Relax in our indoor pool & hot tub; or use the fitness room to keep up with your workout routine. Come and enjoy newly renovated guest rooms in one of the most convenient locations in Concord, NH. EJs on Main serving traditional brickoven pizza alongside classic New England fare. Come and enjoy a drink at EJ's on Main - Monday through Thursday 4:30pm to 10pm; Friday & Saturday: 4:30pm to 11:00pm; Sunday 4:30pm to 9:00pm. Lively bar, local micro brews on tap, great food too. Live entertainment weekly. Closed Sundays. Elegant function room featuring a built-in dance floor, mirrored wall and 8 sparkling chandeliers. Flexible function space featuring lots of natural light (light blocking shades for presentations) and the flexibility of the attached Board room. Can be used as a small casual boardroom or as an add-on to the Capitol Room. Convenient meeting room located just off the hotel's main lobby. This room is easy to find and has natural light (or light blocking shades for presentations). Perfect for a business meeting or a small social gathering. This banquet room is a perfect size for meetings & events between 60-100 people, with seating for everyone. The room can accommodate up to 200 people for a reception. Children's program - McAuliffe-Shepard Discovery Center! Explore the 21st century interactive exhibits, state-of-the-art planetarium, cafe and science store. www.starhop.com or (603) 271-STAR (7827) for exhibit details, program schedule and ticket prices. This rock, with Viking runes, marks the AD 1004 grave of Thorvald, brother of Viking explorer Leif Eriksson and son of Erik the Red. Or -- maybe it's just a rock with scratches on it. New England's best roadside attraction, where performing bears eat ice cream and a trains full of tourists are attacked by a hairy mutant in a Mad Max car.